True, we should not downplay the importance of repatriating the thousands of Gaza Strip settlers, whose presence and the need to safeguard their safety continually torture the Palestinians. But the test remains what is happening in the West Bank, and what is happening in the West Bank is very close to being a colossal failure: of the Palestinian political and popular struggle, of the Palestinian armed struggle, of European nations who abide by international decisions, of those in the Israeli peace camp who had truly hoped for a two-state solution. For the peace lovers among both peoples, the test for success was and has remained the ability of Palestinians in the West Bank and Gaza Strip, as a single public, to build for themselves an independent and fair future, and not to live scattered among Indian reservations. Meanwhile, between a mass demonstration against the settlements and the optimists' talk in favor of the disengagement, the creation of the West Bank reservations continues undisturbed. -- Amira Hass, Optimism is one thing, bulldozers another; 2 Feb 2005. I’m having flashbacks to the Camp David Summit of July 2000, when Ehud Barak Generously Offered to keep 20% of the illegally-occupied West Bank (below left), and to allow the creation of a “Palestinian state” (below right) on the three tenuously-linked and completely surrounded enclaves that remained. To understand how you start off with the West Bank, and end up with Barak’s Rorshach test of a Palestinian state, you have to bear in mind where Israel has positioned its major settlements (map, left). 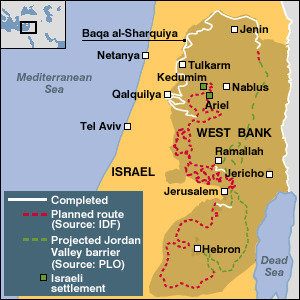 Barak’s proposed dissection of the West Bank began with the annexation to Israel of large swathes of Palestinian land around these major settlements (Map, below left). In the north: The northern portion of “Palestine” would be largely separated from the center by the annexation of land extending deep into the West Bank from the Ariel settlement (marked “A” in map below, left). This step would also transfer to Israel control of the West Bank aquifer upon which Palestinians depend for most of their water. In the centre: Arab East Jerusalem would be separated from the rest of the occupied West Bank, and the central portion of “Palestine” almost completely severed from the southern part, by the annexation to Israel of a large tract of Palestinian land around East Jerusalem (J), and the annexation of Maale Adumim settlement (M), whose enlarged boundaries would extend east to Jerusalem and west as far as Jericho in the Jordan Valley (Je). Some maps of the Generous Offer™ suggest that the extension of Maale Adumim would actually reach the River Jordan, cutting Palestine in two at Jericho. In the south: The annexation of Gush Etzion settlement and surrounding Palestinian lands (G) would begin a North-South split through the southern portion of the Palestinian state. Barak then proposed that a further 10% of the West Bank would technically be assigned to the Palestinian state, but in practice would remain under long-term “temporary” Israeli control (Map, below right). This land included the Palestine’s entire international border with Jordan (marked, "V"). In the south, it also included the Hebron enclave/Kiryat Arba settlement (K) and a finger of land joining Kiryat Arba/Hebron to Israel proper. The Kiryat Arba extension, in combination with the Gush Etzion annexation, would effectively cut the southern third of “Palestine” in two from north to south. That was how the boundaries of Barak's "Palestine" were created. 1. Ariel: In October 2003, the Israeli government approved a route for the northern section of the Separation Wall that would encroach into the occupied West Bank by about 12 miles, in order to include the settlement of Ariel on the Israeli side (Map, via the NY Times). In deference to U.S. concerns that an intrusion on this scale is “problematic” for the creation of a viable Palestinian state, the Sharon government assured the Bush Administration at that time that it would build the Wall around the individual settlements in the Ariel bloc, but not the sections that join the Ariel bloc to Israel proper. Work on the Ariel section was halted altogether in September 2004, when Palestinians from Salfit sought an Israeli court order to halt the confiscation of their land for construction of the Wall. Israel has resumed construction of one of the most controversial parts of its separation barrier in the West Bank - deep inside the occupied territory. The attorney general approved the work near Ariel settlement on Monday, four months after a court order halted it. The BBC's Barbara Plett in Jerusalem says Israel's resumption of work on the fence around Ariel could set the stage for confrontation. It is widely believed that Israeli Prime Minister Ariel Sharon intends to connect the four-kilometre (2.5-mile) section of fence around Ariel to the main West Bank barrier at a later date, she says. Such a measure would threaten the territorial continuity of any future Palestinian state, our correspondent adds. -- BBC News: Israeli barrier move sparks anger; 25 January 2005. 1. Annexing East Jerusalem: Israeli journalist Meron Rapoport revealed in Haaretz Magazine (21 January 2005 edition) that: As a result of a secret Israeli government decision, thousands of Palestinians living in the West Bank who own land or homes in East Jerusalem lost all rights to their holdings. And there are already plans to build on the expropriated land. The decision to seize as much as half of all Palestinian property in East Jerusalem was made in June 2004 by Israeli government ministers Natan Sharansky  and Zevulun Orlev, but concealed from the public until Rapoport’s investigation. The land in question belongs to Palestinians who have been separated from their property by Israel’s Wall: Sharansky and Orlev ruled that this forced separation from their land makes the Palestinians “absentee” owners whose “abandoned” land may now be confiscated by the Israeli government. Some of the people whose property was expropriated by the decision and who were declared "absent" live only a few meters away from their land, but cannot reach it simply because they are walled out. The Israeli government has quietly seized thousands of acres of Palestinian-owned land in and around east Jerusalem after a secret cabinet decision to use a 55-year-old law against Arabs separated from farms and orchards by the vast "security barrier". Most of the hundreds of Palestinian families whose land has been confiscated without compensation have not been formally notified that their property has been transferred to the Israeli state. But plans have already been drawn up to expand Jewish settlements on to some of the expropriated territory. The move has drawn stinging criticism from the Palestinian leadership and some Israelis, who call it "legalised theft" and say it is evidence that the vast steel and concrete barrier under construction through the West Bank and Jerusalem is less for security than a move to expand Israel's borders. The cabinet secretly decided to seize the land in July last year using a law passed in 1950 allowing the state to confiscate property abandoned by Arabs who fled to neighbouring countries during Israel's independence war. Among those who have lost their land in the recent seizures is Johnny Atik. His front room, in the Bethlehem house he has lived in for 55 years, looks on to the three hectares (eight acres) of olive groves from which he is now officially deemed absent after Israel built the "security fence" between his home and his orchard. "What is the law of absentees when we are here before your eyes? We are not absent. The law is that any Israeli with an American or European passport who goes to live outside Israel is not considered absent. But me, who lives here, is called absent," he said. The government declined to discuss the new application of the absentee property law. Since the signing of the Oslo accords a decade ago, Israel has doubled the size of the Jewish settlements. Many Palestinians suspect that the West Bank barrier was just another means to grab territory. "This is state theft," said the mayor of Bethlehem, Hanna Nasser. "They are thieves and they are bluffing everybody. It's not a security wall, it's the future frontier of the state of Israel." -- Israelis use barrier and 55-year-old law to quietly seize Palestinians' land; 31 Jan 2005. (Thanks to David F for the link). -- Government will be able to sell Palestinian property in E. J'lem; 30 Jan 2005. -- A property theft that must not be allowed; 28 Jan 2005. -- Attorney General: Decision to seize land was made without my consent; 31 Jan 2005. -- Like thieves in the night; 2 Feb 2005. -- Throwing the ball to the Americans; 3 Feb 2005. (Israel's Attorney-General announced on 1 February 2005 that he was annulling the government's decision seize Palestinian land in East Jerusalem. It is not yet known whether the Sharon government intends to introduce legislation to circumvent the Attorney-General's ruling). With a systematic methodology that raises the possibility that there is some conscious, organized master plan, Israel continues the trend it began more than a decade ago: By denying the Palestinians freedom of movement and the right of residency in Jerusalem based on various excuses, Israel is striving to disconnect the West Bank from East Jerusalem, the Palestinian Jerusalem, and its surrounding neighborhoods and villages that, like it, were annexed to Israel. By July, Israel plans to complete the procedure not only with physical measures like constructing the wall, fence, obstacles and barriers dividing neighborhoods, even houses in half and artificially, finally separating "Jerusalem" from the "West Bank," but also with a bureaucratic separation. As of July, Palestinian Jerusalemites will not be allowed to go to Ramallah. That's when the wall in Jerusalem will be completed, and the Qalandiya checkpoint will be turned into a form of a "border terminal," even though it is far from the Green Line. Those who want to go to Ramallah will have to ask for special permits, as has become evident in recent days. Experience shows that the humiliation and difficulties involved in getting a permit reduces the number of those seeking one. Ramallah could gradually empty itself of Jerusalemites the way Nablus and Jenin and Gaza have ceased hearing the Jerusalem accent on their streets. Or alternatively, many Jerusalemites won't be able to give up their ties to Ramallah, and they will do what, for decades, Israeli governments have been openly hoping for: They'll give up their residency in Jerusalem completely. --Separating Jerusalem from the West Bank; 26 Jan 2005. -- East Jerusalemites will need permits to visit Ramallah; 25 Jan 2005. On a barren hillside just outside Jerusalem, yellow backhoes and bulldozers spent about six weeks late last year leveling a space the size of four football fields for a new police station -- the first step in expanding the settlement of Maleh Adumim to reach the edge of Jerusalem, less than two miles away. But the work was illegal, according to the Supreme Planning Council, Israel's highest development authority in the West Bank. Israeli army Lt. Talya Somech, a spokeswoman for the West Bank's civil administration, said that without building permits or approved plans, the project "violated the laws of planning and construction." It also violated Maleh Adumim's master development plan. The Maleh Adumim work is part of an expansion plan officially known as E-1, which anti-settlement activists said is the final step in sealing off north and east Jerusalem from Palestinians living in the West Bank. Moshe Merhavia, a senior Housing Ministry official, said that when E-1 is finished, it will double the size of Maleh Adumim, which has 30,000 residents. U.S. officials have opposed the plan for years. -- Israelis Act to Encircle East Jerusalem; 7 February 2005. 1. The annexation of Gush Etzion: On 30 January 2005 the route of Israeli Wall in the directly south of Jerusalem was finalized. Prime Minister Sharon refrained from seeking his Cabinet’s approval and making public the proposed route until after the Sharm as-Sheikh Summit, as the proposed route is hardly compatible with a “new era” of cooperation and negotiation between Israelis and Palestinians. The cabinet is slated to approve two historic decisions on Sunday: the evacuation of settlements in the Gaza Strip and northern West Bank under Prime Minister Ariel Sharon's disengagement plan, and the route of the separation fence around Gush Etzion and the South Hebron Hills. The two decisions are being brought at the same time in an effort to neutralize international criticism of the fence route by coupling it with the decision to evacuate settlements. 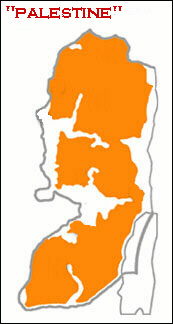 The fence route, whose approval Sharon has repeatedly postponed due to its diplomatic sensitivity, is effectively a "package deal" meant to satisfy both hawks and doves: The fence will penetrate deeply into the West Bank to encompass the Gush Etzion settlements, but will follow the Green Line around the South Hebron Hills. The route around Gush Etzion is expected both to elicit fierce protests from the PA and to be challenged in the High Court of Justice, as it will enclose four Palestinian villages with some 18,000 residents, plus a sizable amount of Palestinian land in addition to the Israeli settlements. This is the part of the route about which Sharon hopes to mute criticism by linking it to the disengagement plan. -- Cabinet set to approve settlement evacuation, fence route; 15 Feb 2005. -- Without unnecessary provocation; 31 Dec 2004. -- Israel Plans New W.Bank Settlement After Gaza Exit ; 15 Feb 2005. Adv. Shlomo Leker of Jerusalem, who represented the people of Twane during numerous previous attempts to expell them or confiscate their land, believes that the order is aimed at extending the nearby Israeli settlement of Ma'on, whose inhabitants on numerous occasions used violence against the Palestinian villagers. In general Adv. Leker noted that, while everybody's attention is directed to the Gaza Redeployment, all over the West Bank the land grab is going on at a pace which he never experienced in his long career of confronting land confiscations in the courts. When asked to comment by Yossi Gurevitz of the Nana News website, the IDF Spokesman answered: "Such a village does not exist". -- Gush Shalom; via email, 14 Feb 2005. While the world believed that Rabin promised to eventually end the occupation and dismantle the settlements, the number of Israeli settlers actually doubled during his rule. At the same time that Barak declared he intended to dismantle the Golan Heights settlements, in 1999, he actually poured money into their expansion. As Sharon promised to dismantle at least the illegal settlement posts in the West Bank, their number kept increasing. Still, none of this is ever remembered. Each new lie is received with welcome cheers by the Israeli peace camp and by European governments. Since Oslo, every Israeli government knows that all it takes, to ease diplomatic pressure, is to come up with a new "peace plan". -- Sharon's Gaza Pullout: Not Gonna Happen! ; 16 Nov 2004. 1. While haggling proceeds over the minutiae of the Gaza plan, Israel will take unilaterally what it wants elsewhere, during an extended "interim period" in which final status issues must not be discussed. 2. The P.A. will appeal for international action to halt illegal creation of facts on the ground that prejudice the outcome of eventual final status negotiations. 3. The U.S. and U.N. will deem Israel’s actions unfortunate, but do nothing for fear of undermining the “process”. 4. And when the gap between the "peace process" and the facts on the ground becomes too big for the P.A. to sell to the Palestinians, Intifada III will begin. 5. The Palestinians will be denounced as terrorists for disrupting the “peace process”. This is déjà vu all over again. Last time it was the Oslo process that kept us all happily distracted from the imposition of facts on the ground, this time it is a Gaza Disengagement plan that might or might not actually happen. Either way, in seven years of Oslo and four of intifada, we all seem to have learned precisely nothing about the futility of elevating the "peace process" above what is needed to actually make peace. The map of the major settlements is via the BBC; all other maps adapted from Gush Shalom via Media Monitors. So, democracy apparently means not only having the right to voice your opinion in the town square, but also having the right to occupy your neighbor's town square, forcibly exclude your neighbor from it, then steal it and hand it over to developers. - GOI [Government of Israel] immediately dismantles settlement outposts erected since March 2001. - Consistent with the Mitchell Report, GOI freezes all settlement activity (including natural growth of settlements).